Today's entry is a good one. Hugh Grant and Director Marc Lawrence first teamed-up for 2002's Two Weeks Notice, which was a hit. Their next partnership was in 2007's Music and Lyrics, which wasn't as successful, but is a film which I think is very underrated. Things went off the rails a bit with 2009's Did You Hear About the Morgan's?, a movie which missed the mark both critically and with audiences. It was during this time that Grant, who had made film-after-film, began to slow down a bit. (I remember reading that he'd retired from acting.) But, in 2013, Grant and Lawrence got back together for a new film, entitled The Rewrite, which was good, as they were both due for a hit. Grant stars in The Rewrite as Keith Michaels, an Oscar-winning screenwriter whose best days are behind him and who can no longer find work. His agent, Ellen (Caroline Allen), finds him a job as the writer-in-residence at Binghamton University in upstate New York. Desperate, Keith takes the post, with no intention of actually working. Upon arriving in town, he meets his new boss, Dr. Lerner (J.K. Simmons), his neighbor and fellow teacher, Jim (Chris Elliot), and his stern colleague Professor Weldon (Allison Janney). Keith also meets a student, Karen (Bella Heathcote), and promptly begins a relationship with her. At the first session of his screenwriting class, Keith tells his students to keep writing and to meet him back there in a month. At the student store, he meets Holly (Marisa Tomei), an older student who hopes to get into his class. Despite his best intentions of not working, Keith begins to feel an old spark emerging as he works with the students on their screenplays and he starts to understand that he does have some wisdom to impart. We've seen plenty of movies where irony is used to move the plot along, or as a clever way to present humor. How many films have you seen which have an ironic twist ending? However, The Rewrite is an odd movie in that nearly the entire film is ironic. The film deals with a screenwriter who was celebrated for writing an original film, but has now lost his touch. Through working with his students, he's able to discover some fresh young voices. So, why does this movie present us with the most hackneyed, cliched story possible? Once successful professional turns to teaching and is inspired by the kids? Seen it. Said teacher falls for older student attempting to turn their life around? Seen it. Lawrence, who also wrote the screenplay, presents us with one old idea after another and then does nothing to alter the anticipated outcome. Everything that you think is going to happen in this movie happens, as if it were written by a computer which had been fed scripts of dozens of other movies. But, having said all of that, The Rewrite is not a terrible movie, and it gets a lot of mileage out of its cast. Hugh Grant may look a little older, but he still has the ability to be charming and no one delivers a baffled line like he does. His demeanor is spot-on for a character who doesn't want to be where he is and (at first) doesn't care what others think. Simmons and Janney bring a great deal of clout to the film and they are both excellent in their roles. Both excel at being both intimidating and nurturing. The actors playing the students are good as well, and Heathcote must be especially good, as we love to hate her. I hate to say this, but the weak link here is Tomei, who doesn't bring anything special to her role. I would love to say that these fine performances rise above the material, but nothing can change the fact that The Rewrite is simply too pedestrian for its own good. Thus, this is one of those films which "is what it is". We have many familiar and likeable actors making their way through a story which has no distinguishing features. I laughed a few times and I grew to like Keith, but the movie is utterly forgettable and you will walk away knowing that everyone involved can do better. 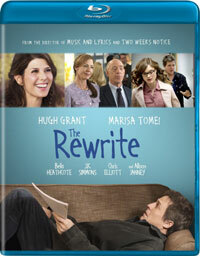 The Rewrite will have you looking up the location of Binghamton on Blu-ray Disc courtesy of Image Entertainment. The film has been letterboxed at 2.35:1 and the Disc carries an AVC 1080p HD transfer which runs at an average of 31 Mbps. The image is sharp and clear, showing no overt grain and no defects from the source materials. The colors look good, most notably greens, and the image is never overly dark or bright. Having said that, the picture is also somewhat flat and there is a lack of crispness to it. The Disc carries a DTS-HD Master Audio 5.1 track which runs at 48 kHz and an average of 4.0 Mbps. The track provides clear dialogue and sound effects. Being a dramedy, we aren't bombarded by dynamic effects here. The stereo effects show some spirit during crowd scenes and we get a few distinct sounds coming from the right or left. The same goes for the surround effects. Save for musical cues, I didn't note any interesting subwoofer effects. The Rewrite Blu-ray Disc contains a few extras. "The Making of The Rewrite" (8 minutes) offers comments from Writer/Director Marc Lawrence, as well as Grant, Simmons, Janney, and Elliot, who talk about the story and the themes, the characters. Grant also talks about his history of working with Grant. The Disc contains two DELETED SCENES which run about 3 minutes. One of these is actually a series of scenes which make up a running joke which was cut from the film. The final extra is a TRAILER for the film.